For the first time in a long time I've made a card just because I can! 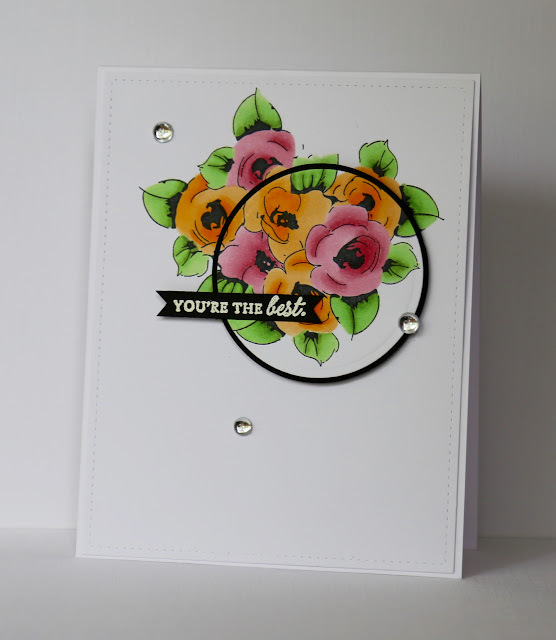 In case you've been hibernating under a rock somewhere, Altenew are having a huge blog hop and it's to say thank you to all papercrafters who organise those fantastic challenge blogs out there. A whopping 18 challenge blogs have joined in with the fun! I used Painted Flowers for this one - it's my only Altenew set so the sentiment is actually from PTI. (Note to self: buy some more Altenew sets.) I don't think I've done these stamps justice at all...I wanted to experiment with Copics but I think I prefer the look of the layered stamping, which is of course what this set is for. Anyway, this little card is for all those lovely ladies out there who put so much effort into running challenge blogs. Having been on a few of the design teams now, I know how much work goes into running these blogs behind the scenes, so thank you - you're the best! Oh what a gorgeous design - I must remember that one. TFS! Oh you colored those blooms to perfection!! LOVE the way you layered them and that little spotlight looks fantastic!